After nearly a decade of legal wrangling, a piece of ancient Roman sculpture worth almost U.S. $2 million has been unveiled to the public for the 1st time. 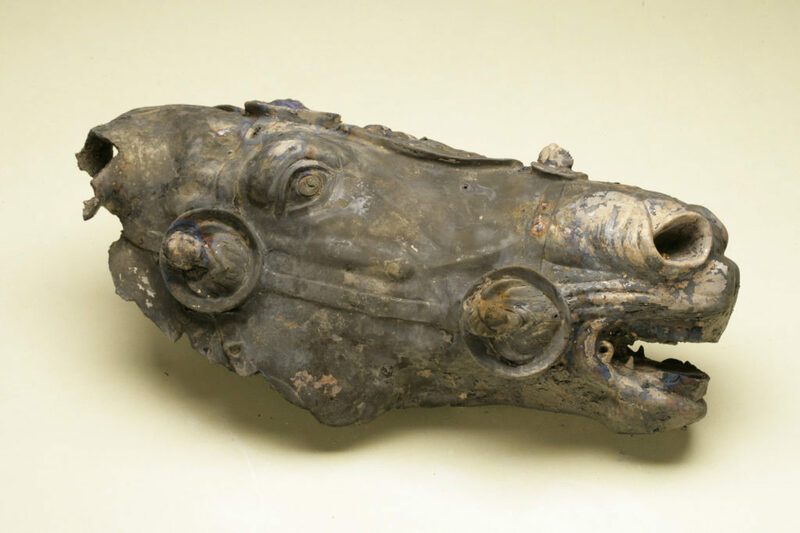 The 28-pound fragment is a life-size horse head dated to A.D. 1. Made of bronze and covered in gold, the head is more just than a spectacular example of Roman art. The horse head was uncovered as part of excavations of a Roman settlement called Waldgirmes, near modern day Frankfurt, and it adds a dramatic new wrinkle to the story of Rome and the Germans. For centuries, historians had agreed that the Romans intended to use military force to subdue Germany’s tribes and creates a new province north and east of the Rhine River. After a catastrophic battle in A.D. 9 cost the Roman army 15000 men, the conquest of Germany was called off. Scarred by the loss—known as the Battle of the Teutoburg Forest—the Roman eventually set up a network of fortifications that defined the northern edge of the Roman world for nearly 300 years. But the horses head and other finds at Waldgirmes, which was excavated by the German Archaeological Institutes Roman Germanic Commission between 1994 and 2009, are evidence that military might was only part of Rome’s plan. The settlement covered nearly 20 acres and had a defensive wall but no military building’s. Its existence shows that the Romans were living next to and trading with German “barbarians” peacefully for years, right up until the Teutoburg defeat, according to lead scientist Gabriele Rasbach of the German Archaeological Institute. Most of the settlements buildings were made of wood, and based on tree-ring data, archaeologists say the town was built from scratch beginning in 4 B.C. Behind 10-foot-tall timber walls, Waldgirmes had pottery and woodworking workshops, Roman style residences, and even traces of lead plumbing. A multi-story administrative building sat at the town’s heart, and in a courtyard or forum outside, archaeologist’s identified pedestals for 4 life-size statues of riders on horses. The gold-covered horses head was part of one of these statues, probably one depicting a Roman emperor. The discoveries at Waldgirmes came as a shock to archaeologists and historians alike. With its shiny statues and lead plumbing, Waldgirmes seems to have been part of an effort to win over German tribe rather than crush them. A few years after the Teutoburg Forest battle, life in the ancient town came to a halt. But there are no signs of a battle or slaughter there, Rasbach says. Perhaps instead, Waldgirmes was evacuated peacefully in A.D. 16, when Roman forces were ordered to abandon the territory they held north and east of the Rhine. After the site was abandoned, Rasbach says, the statue’s were probably deliberately smashed and recycled for their metal content by German tribesmen. Fragments of bronze—160 in all, mostly tiny splinters—were discovered scattered all over the town. The horse head is the one major exception. Not far from the pedestals, archaeologists discovered a Roman-era well more than 30 feet deep. The head sat at the bottom, covered by eight heavy millstones, wooden buckets, tool handles, an ox yoke, and other junk. The horse head did not fall into the well by accident, Rasbach says. Metal was too precious a commodity to waste. Instead, the head may have been thrown into the well as part of a rituals: Tribes in northern Europe often sacrificed horses, depositing their bodies in bogs or rivers. Perhaps the bronze head was part of a similar ceremony, with millstones and other junk thrown in on top of it to seal the sacrifice. Although it was excavated in 2009, the head has been in storage for almost a decade, while a lawsuit by the farmer on whose land it was found made its way through German courts. Last week, the German state of Hessen agreed to pay the farmer almost U.S. $800,000 to acquire the pieces. It will be put on permanent display at the Saalburg Roman Fort beginning on Sunday. And if Waldgirmes was indeed part of a Roman plan to win over the Germans through trade and cultures, it might not have been the only outpost they planted in the wilderness. P. Natasha Covers Classical Archaeology news and has been with Histecho since 2017. She has a Master's degree in MA Archaeology from New York University's Science, Health and Environmental Reporting program. A California native, she also holds a Bachelor of science in molecular biology and a Master of Science in biology from the University of California, San Diego.